Day two on the Inca trail began with a 6:00am wake-up. 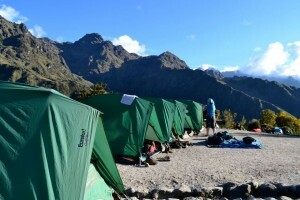 The porters greeted us with a tent-side tea service and a bowl of warm water, a pleasant way to welcome the cool morning. After dressing and packing the group assembled in the dining tent for another rib-sticking meal. This time the menu included peach stuffed pancakes, oatmeal, toast and jam. There was no going hungry in this group! After breakfast we hit the trail and it was uphill again right off the bat, an incline that lasted about two hours. Although we had left the porters behind at camp to clean up and break down, it was no surprise to soon see them darting up the trail behind us, easily passing us by. It was humbling, in fact, to see their seemingly effortless ascent of the trail and how quickly they overtook the pack of gringos who had had a significant head start and weren’t laden with equipment for setting up camp and feeding a group for four days. Our guide, Edgar, told us that elite athletes complete races up the trail in mind-boggling times. He himself claimed to have done the trail in six hours – the same distance that was taking our group the better part of three days. Two hours of incline took us to the highest point on the Inca trail, Abra Warmiwañusca – or “Dead Woman’s Pass,” supposedly named for a mummy discovered there — at an altitude of approximately 13,780 feet. We were rewarded with a rest and some truly amazing 360-degree views of the majestic Andes. 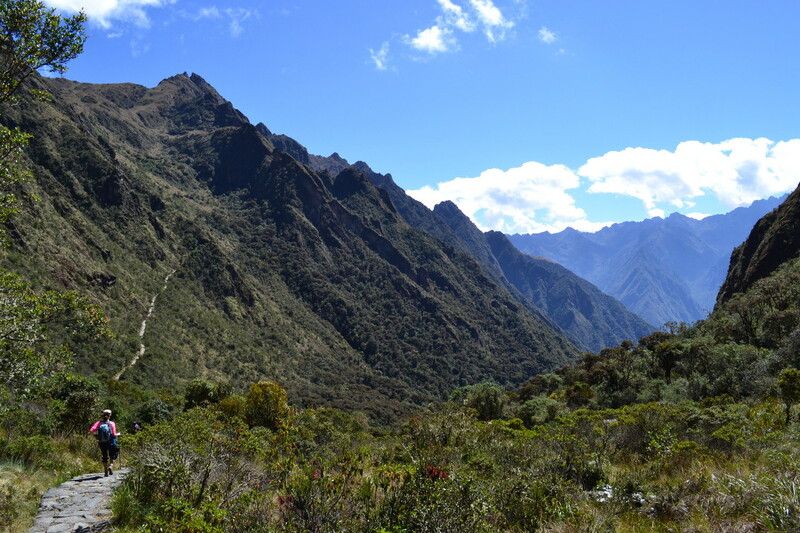 Waking up in the mountains and spending the days surrounded by their beauty was a joy throughout the trip – easily the best part of the Inca Trail experience. The uphill climb that took us to Warmiwañusca was not as brutal as yesterday’s ascent, but the downhill stretch that followed was still a welcome reprieve. It was not fast going, though. 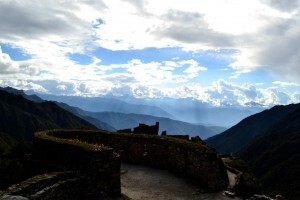 In some ways, hiking down is more challenging that hiking up, and I was glad to have the walking sticks we had rented back in Cusco – a piece of equipment I would strongly encourage any Inca Trail trekker to purchase or rent. Throughout the day’s hike we would pass three different sets of Inca ruins, and at each our knowledgeable guide gave us tours and spoke about the Incas and the purpose of the buildings. They really were amazing people – so advanced with how they designed their structures and how they thrived in such difficult terrain. 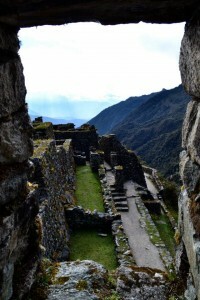 One of the ruins we saw that day was called Sayaqmarka and was likely used as a resting spot for those journeying to Machu Picchu (like us…?). We were able to walk through the ruins and climb on the stones as Edgar imparted more knowledge about the history of the site and its people. I tried to imagine living there and what it would have been like to spend your life perched on a mountainside, waking up to those surroundings every day of your existence. We arrived at camp that night between 4:00pm and 5:00pm, and I’d be lying if I said I wasn’t ready. After a quick wash up and wardrobe change we headed to the dining tent, where we chatted over tea, popcorn and what appeared to be homemade chips and guacamole – the porters never ceased to impress! Once the sun went down we were given our proper dinner and the usual hot drinks, and then it was off to bed, at the late hour of 8:00pm.